You can listen to our extended conversation with Bashir (and check out the amazing videos we talked about) and hear her read in person at the Portland Art Museum May 18 as part of the De-Canon Project. FIELD THEORIES WINS THE 2018 OREGON BOOK AWARD! Thank you to the judges, to Literary Arts, and to the entire Oregon community of readers and writers, plus all those around the country who have supported this work. Congratulations to all of the winners and finalists. What an incredible group and what an honor to be a part of it. I am honored to have Field Theories recognized with the 2018 Stafford/Hall Award for Poetry. What a gift! Well well well what sweet sunny day news — I love (like:love!) every single one of these books. Read about CLMP’s Firecracker Awards and see all of the finalists here! We all know FIELD THEORIES is currently a finalist for this year's Oregon Book Award / Ken Stafford Award for Poetry alongside manuel arturo abreu, Allison Cobb, Stephen Lackaye and Ed Skoog. Well, it's also up for the Readers Choice Award this year. Art Practical considers “Elements of Reclamation,” an exciting exhibition of socially engaged artwork by black women and non-binary artists which opened Portland’s newest art space, Ori Gallery, a new space bringing black art back to Portland’s Mississippi neighborhood, run by Maya Vives and Leila Haile. Co-curated by local poet and artist Samiya Bashir, Elements of Reclamation features work by five local Black artists: Melanie Stevens, Lisa Jarrett, Intisar Abioto, sidony o’neal, and Ori [Gallery]’s own Maya Vivas. Combining facets of sculpture, installation, text, and illustration, the convergence of these powerhouse individuals creates an energetic and potent force field for queer and femme voices. The exhibition begins with Melanie Stevens’s If You’re Watching This, It’s Too Late (2017), a large chiffon and silk print installation, over ten feet, that spans the entirety of Ori. If You’re Watching This, It’s Too Late provides a sort of second entry into the space; viewers first admire the way it hangs tantalizingly close, like a portal, as they walk underneath. Then they have to make a decision as to whether they continue their visit to the left or right of the work, given that the hanging splits the room in two. Read the full write-up here! Willamette University's Collegiate shouts out my recent come-through. Through repetition and renewing contexts, these phrases get absorbed into the listener’s subconscious, rumbling there. "You're really faithful to your abusers, aren't you?" Deepest gratitude to the great and powerful Dr. Dawn Lundy Martin and the Academy of American Poets' Poem-a-Day for getting the ball rolling on publishing my new work. I suppose it's getting on time to start letting it go. Please join us for the first event of the Spring 2018 Hallie Ford and Teppola Literary Series, a poetry reading by Samiya Bashir. The reading will take place on Monday, February 12th at 7:30 p.m. in the Hatfield Room (2nd floor of Hatfield Library) and is free and open to the public. Please join us for the first event of the Spring 2018 Hallie Ford and Teppola Literary Series, a poetry reading by Samiya Bashir. The reading will take place on Monday, February 12th at 7:30 p.m. in the Hatfield Room (2nd floor of Hatfield Library) and is free and open to the public. PLEASE NOTE: The event date has changed. Previously, Professor Bashir was slated to read this Thursday. Due to a scheduling conflict, the event has been changed to next Monday, February 12th. So mark your calendars! Samiya Bashir is the author of three books of poetry: Field Theories; Gospel; and Where the Apple Falls, which were both Lambda Literary Award finalists. Her poetry, stories, articles and editorial work have been featured in numerous publications most recently including Poetry, World Literature Today, Ecotone, HOAX, The Offing, and Poet Lore among many others. Sometimes she makes poems of dirt. Sometimes zeros and ones. Sometimes variously rendered text. Sometimes light. Bashir has collaborated with a number of visual and media artists on projects such as M A P S :: a cartography in progress, with Roland Dahwen Wu, Coronagraphy with Tracy Schlapp, and “Breach,” with Alison Saar, currently on exhibition at L.A. Louver. She lives in Portland, Oregon, where she teaches creative writing at Reed College. 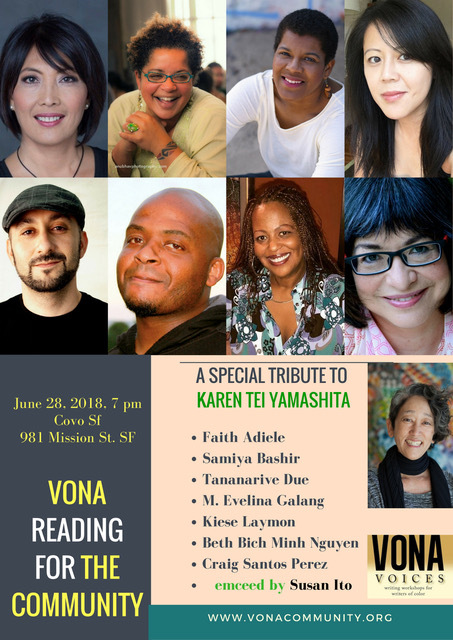 So proud to join the faculty of Voices of Our Nation's Arts Foundation (VONA) whose premier summer writing intensive has been nurturing writers of color since 1999. Apply Today to join me and a warm, vibrant community of writers in Berkeley, California, for a week of poetic summer's light. Come and work with me this summer. Let's make some magic! FIELD THEORIES short-listed for the Oregon Book Awards! I'm honored to have FIELD THEORIES short-listed for the Oregon Book Awards' Stafford/Hall Award for Poetry. Come to the ceremony to celebrate a year's worth of groundbreaking books! CLICK HERE TO VOTE FOR *FIELD THEORIES* IN THE 2018 READERS CHOICE AWARDS! Oregon Book Awards & Fellowships supports, promotes, and celebrates Oregon’s writers and publishers. On Monday, April 30, Literary Arts will host our annual celebration of the state’s most accomplished writers in the genres of poetry, fiction, nonfiction, young readers, and graphic literature. This event draws an audience of over 500 literary enthusiasts from our local community and beyond. Young adult author Renée Watson will host this year’s event. 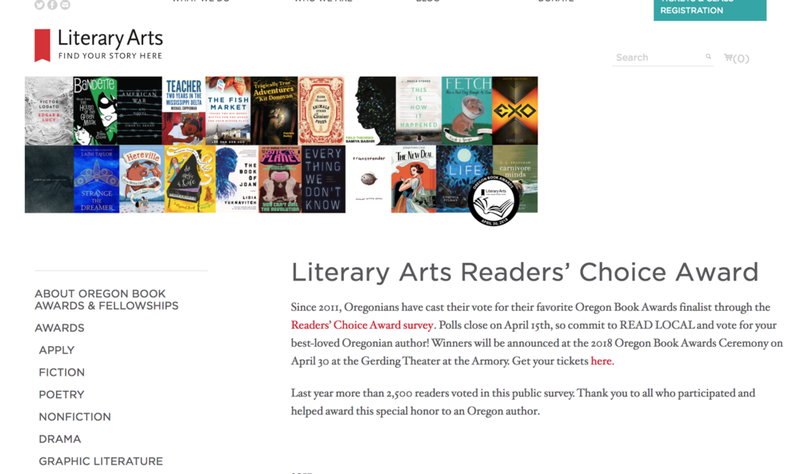 Cast your vote in the Readers’ Choice Award survey and help your favorite Oregon Book Award finalist win a special honor. The winner will also be announced live at the ceremony on April 30. Click here to vote. Tonight @ Powell’s City of Books! It should be a good conversation and I hope to see you there! Join me with Poetry Magazine editor Don Share, Fred Sasaki, and Ed Skoog as we hear from their new Book WHO READS POETRY: 50 VIEWS FROM POETRY MAGAZINE and talk about poetry in our contemporary moment. I first woke up to a deeply annoying email patronizing MLK day with a 2nd grade interpretation of his legacy. Then The Academy of American Poets started releasing poems in honor of the day. First June Jordan, than me. Read the rest of Aisha Sabatini Sloan's keynote for NonfictioNOW 2017 in Reykjavík, adapted here for Lit Hub. "It’s easy to find poetry in science, from the ring of Latin names to the construction of an elegant theory. It’s a harder thing to find science in poetry. 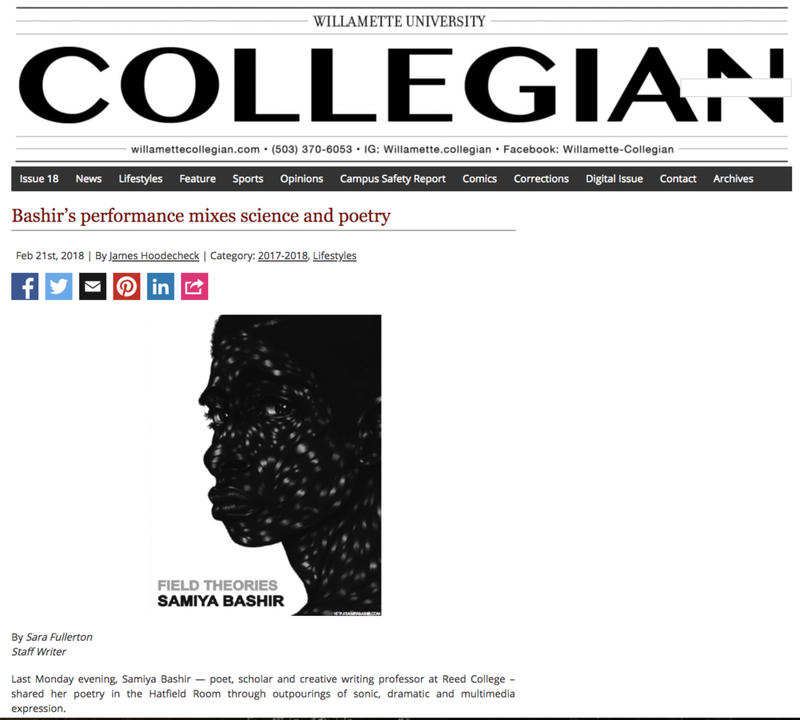 But that is the genesis of Portland poet Samiya Bashir’s book “Field Theories,” where poems titled after scientific principles like “Planck’s Constant” and “Synchronous Rotation” plumb the space where theories collide with real life: from the back seat of a taxi to jazz clubs, early morning cigarettes, human fables, gun violence and Groucho Marx." "One thing’s for sure," muses Lambda's Shane Michael Manieri, "Field Theories contains an energy, or energies, and Bashir explores every aspect of it/them." Of Field Theories, Adrian Matejka said, “There is so much happening in these poems…” And it’s true. There are poems in the voices of John Henry and his wife, Polly Ann, in sections titled “Coronagraphy,”—a coronagraph, as some may know, is a telescope that uses a disk to block the Sun’s bright surface so that one might be able to see things close to it. However, one can’t help but think of a Coronary Angiography, which is a scientifically medical system that X-rays the chest to detect blockages in the heart—which have the literary craftsmanship of Jean Toomer, and is a further study into the relationship between the monumental black figure—be it male or female—and social science, people and their environment, their societies and have the lyrical ballad swing of the language we hear on the street mixed with the colorful characters of the American folklore: man against machine, man against boss, man against the power structure. The Regional Arts & Culture Council (RACC) is pleased to announce its 2017 Fellows in Literature – Portland writers Samiya Bashir and Rene Denfeld. RACC’s fellowship program honors local artists of high merit. Recipients receive a cash award of $20,000 to sustain or enhance their creative process.